A newly proposed hemp facility has the community of Bruderheim talking. 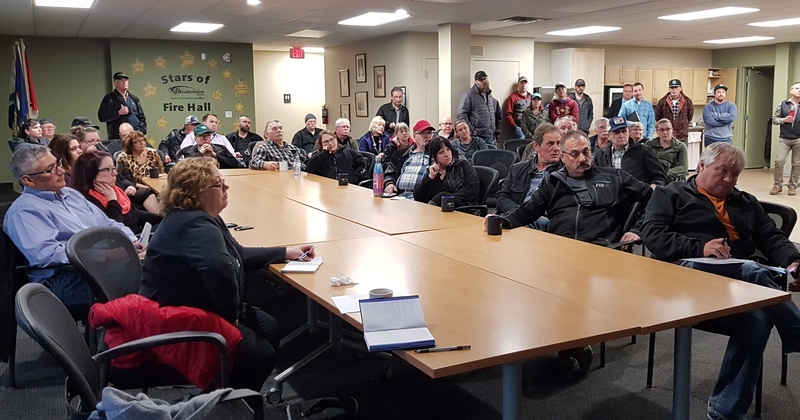 Canadian Rockies Hemp Corporation (CRHC) held an open house in Bruderheim on Monday, April 15 to update residents on the construction plans of their new hemp processing facility, as well as address any comments and concerns from local residents. Construction on the facility will begin later this year and CRHC was met with a mixed reception at their event. A slide show presentation showed a map of the 75 acres of land, which will house the 40,000 sq. ft. facility, a sales office, an outdoor bale storage area on a high point in the land at the rear of the property, with approximately 20 acres of hemp crop being grown onsite. In addition to showing the exact location of the facility on the property, CRHC CEO Aaron Barr communicated three planned storm water collection ponds to address excess water. Ron Ewasiuk, whose home lies directly North of the planned facility, expressed concerns for the increase of water that already accumulates and runs from the vacant field through his property. “I know you’ve got three storm ponds, I’m not sure what their capacity is going to be, but are you aware of the amount of water that comes down that hill?” Ewasiuk asked. Local resident Ron Ewasiuk and Canadian Rockies Hemp Corporation CEO Aaron Barr. Barr explained that knowing the ongoing concern of flooding, they have been working closely with their civic engineers to alleviate the problem with oversizing their collection ponds. Although Barr is hoping this will contain the issue, Ewasiuk was not convinced. “You cannot really predict or project this water level every year. They have no idea the potential of the water level,” added Ewasiuk. Residents also expressed concerns about traffic, dust, security and fire risk to outdoor bale storage. Barr explained that the traffic will be mostly a matter of farmers bringing in their hemp crops and expects to see five to ten trucks per day. As well, an effective dust capture system will be running inside the facility. While plans for security are not yet finalized, a fence around the drainage ponds will be looked into. In addition, dry hydrant hook ups will be installed at each pond to assist in the event of a fire at the outdoor bale storage area, which will be located at the rear of the property. One local resident, who asked to remain anonymous, was eagerly anticipating the hemp facility moving into town. “Bringing something clean like clothing that’s biodegradable and making good use of a piece of property that’s Canadian owned. How many businesses can we find that are that way? They have a strong ethic from what we’ve seen,” they said. The Town of Bruderheim’s mayor Karl Hauch attended the open house to help the new local business feel at home. “Let’s give these folks a hand and welcome them to Bruderheim,” said Hauch, while leading applause. The facility is expected to process approximately 10,000 acres of hemp its first year, bringing with it 10 new jobs to the area. Over the next two to three years, production will increase up to 50,000 acres of hemp with up to 50 new jobs available. The working hours will begin with an eighteen-hour day seven days a week and increase steadily to round the clock. With a development permit in place and awaiting approval, the construction is expected to take four to five months with a projected opening date of October 1, 2019. Job postings for all experience levels are expected to be available on the CRHC website by the end of summer.